Reviews and opinions about dolls and doll-related toys. I have been looking forward to this post for a long time. 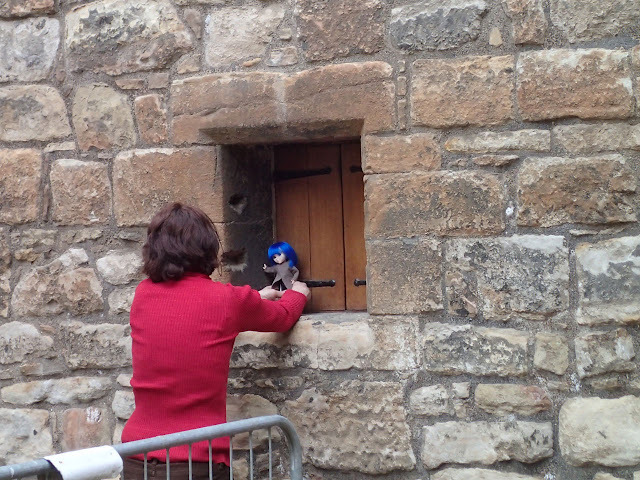 My guest today is Charlotte--a talented doll artist from the United Kingdom who specializes in customization. Charlotte mixes and matches bodies and heads (Azone bodies with Licca-chan heads is a favorite of hers...) and also repaints a variety of dolls ranging from Obitsu to Monster High. You can see her work on Instagram and also on Tumblr. Charlotte and I started communicating over a year ago, at which point she had a ton of great ideas for a customization-themed guest review. My favorite idea of hers was that she share some of the techniques behind her beautiful repaints. Well...as it happened, Charlotte got busy earning a degree and I got busy playing with dolls, and it ended up taking a year to pull this post together. That all worked out for the best, though, because Charlotte has gotten even more accomplished over the last year, and has actually opened an Etsy shop (Milklegs Dolls) through which I was able to purchase a few of her repainted Monster High and Ever After High dolls. So, in this post Charlotte will walk us through her repainting process and then I will share some pictures of my two exquisite Milklegs girls. Ever After High Briar Beauty and Monster High Frights, Camera, Action! Clawdeen Wolf. Repainted by Charlotte of Milklegs Dolls. There's a pretty long title for this review, so let me explain. My boys and I were in Manhattan last week to visit family, and of course I was eager to check up on Toys R Us or F.A.O. Schwarz--outings that were canceled during our last trip because of my broken leg. As I was trying to decide between these two flagship stores, my mom mentioned that the F.A.O. Schwarz store was closing--or had already closed, she couldn't remember. I need to pay more attention to the world because this sad news took me completely by surprise. I panicked a little and immediately wanted to head uptown to see if the store was still open (and if there were any toys left in stock). As a matter of fact, the Manhattan F.A.O. Schwarz store closed its doors on July 15, just two days after our visit. F.A.O. Schwarz has had a store on Fifth Avenue in Manhattan for over 100 years (21 years at 303 Fifth Avenue, 55 years at 735 Fifth Avenue and 31 years across the street at 767 Fifth Avenue). The location has become a beloved stop for me and my family over the last few decades--made even more appealing to my growing boys with the arrival of the Apple Store as a next-door neighbor in 2006. My eldest son, my mom and I all went to pay the store our last respects. I'll share a little bit of that visit with you, and I'll also review the two dolls that my mom bought for me while we were there. Even before we arrived at the store, I knew which dolls I was hoping to find: the customizable 9.5-inch Doll Factory girls by Madame Alexander. I have been eyeing these cuties for years and, as far as I know, they were only available at the F.A.O. Schwarz brick-and-mortar store. This means that the dolls are--temporarily--no longer available. Much to my relief, even though most of the doll brands were sold out by the time we arrived, the Doll Factory was still functional...kind of, and the smaller dolls were on sale for around $20. 9.5-inch Madame Alexander Doll Factory doll from F.A.O. Schwarz. The Disney Channel is releasing a movie at the end of the month called Descendants. This show is set in a modern-day imaginary kingdom and focuses on the offspring of famous Disney characters. Re-imagining fairy tales has been an extremely popular theme these past few years--both in the movie/television world (Maleficent, Cinderella, Snow White and the Huntsman, Once Upon a Time, etc.) and in the doll world (Ever After High, Once Upon a Zombie, Fairy Tale High, Tonner's Re-Imagination line...and probably a few that I'm forgetting). It's especially noteworthy how similar the Descendants premise is to the the inspiration behind Ever After High. The Descendants movie plot centers around Ben, who is the son of Belle and the Beast. The teenaged prince decides to invite several of the villain's kids (who have grown up banished on the Isle of the Lost) to attend his fancy prep school...and then--if I am judging from the trailer correctly--promptly falls in love with one of them. The villain kids feel torn between the wishes of their evil parents and a growing fondness for Ben and his royal friends. Several things about this whole set-up are confusing to me (do all of the fairy tale characters live in the same kingdom? Are they all the same age? Why does Ben get to be the leader? Didn't most of the villains die before they got to reproduce?) but I'm willing to wait and see if everything is explained in the actual movie. I thought that the 11-inch Descendants fashion dolls were being released just before the movie (on July 20th), so I pre-ordered a few of them and was eagerly anticipating their arrival. However, last weekend I was visiting a Toys R Us store up north and found four of the dolls already in stock! This was a nice surprise, so I jumped on the chance to do a review of one of the characters I didn't pre-order--who actually seems like she might be the star of the whole movie: Mal, the daughter of Maleficent. 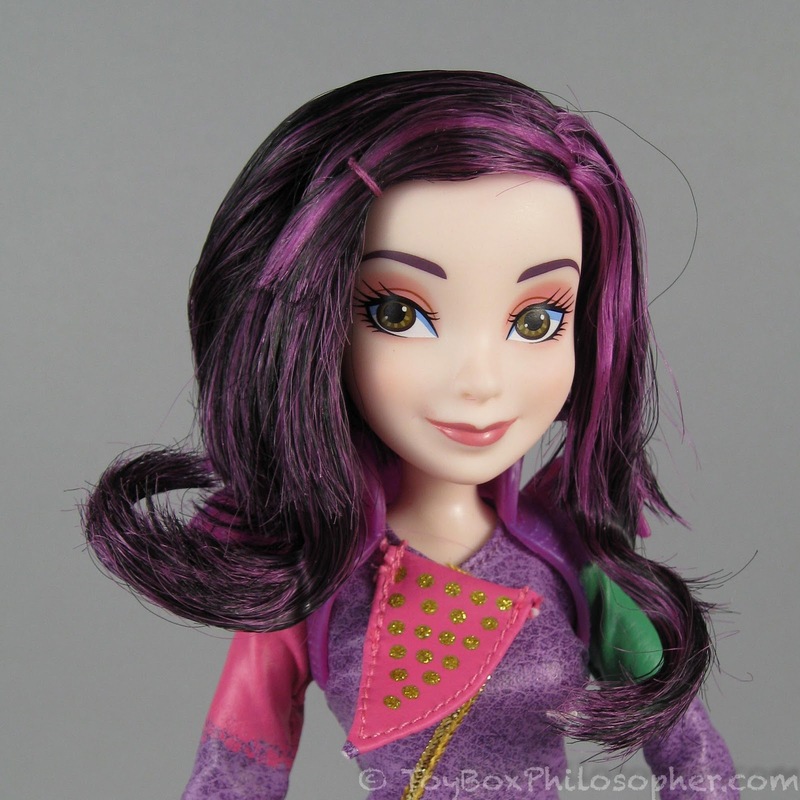 Disney Descendants "Signature Mal" doll, $19.99. I first noticed the Goldie Blox toys last holiday season at our local high-end toy store (Rainbow Toys). This line offers themed building sets that are designed to teach young girls about basic engineering principles. The sets typically include a small storybook featuring a spunky yellow-haired heroine named Goldie Blox. Goldie's story will relate somehow to the theme of the construction set. For example, in the "Goldie Blox and the Movie Machine" set, Goldie's book is about how the local movie theater has to deal with a broken projector--right before a big film festival event. Goldie and her friends engineer an innovative solution to this crisis, and the accompanying building set allows real kids to construct a cardboard zoetrope movie machine. My boys grew up with every kind of building set we could get our hands on, and so this is exactly the type of toy I would have bought when they were younger. 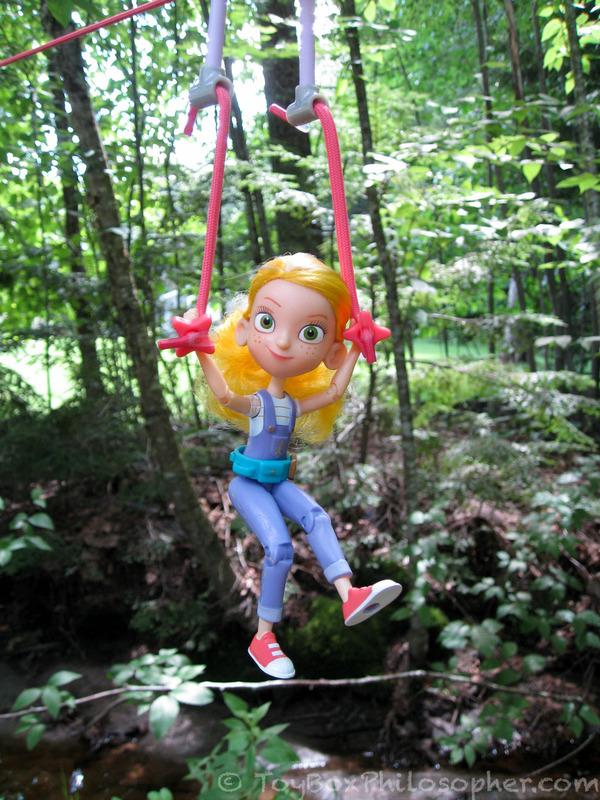 Although most of the Goldie Blox sets come with a building kit and a storybook, there's one set--"Zipline Action Figure"--that comes with a building set and a 6.5-inch articulated doll. I figured that this gave me the perfect excuse to review a Goldie Blox toy here on the blog. Sadly, though, when I inspected the sets up close at Rainbow Toys, the dolls looked poorly constructed for their $25 price, and the building pieces seemed scant. So I walked away empty-handed. The Goldie Blox Zipline Action Figure, $15.99. Hello loyal Toy Box Philosopher readers! I'm Andy, and as Emily’s husband, I’ve had the pleasure of watching Emily take her love of dolls, photography, and writing and blend them into this amazing site. Although I’m not naturally drawn to dolls (when people catch me looking at the site, I tell them I’m reading it for the biology jokes), I’ve come to appreciate them, both through Emily’s eyes, and occasionally, through yours. As a thank you to all of you and as a surprise anniversary gift for Emily (she loves surprises), I thought I’d give you a really quick “behind-the-scenes” view of what goes into making the blog. This blog reviews and discusses dolls and toys that have caught my attention. You can use the search feature at the top of the page if you are looking for information on a specific type of doll. Please feel welcome to comment--I'd love to hear your own honest opinions of these dolls or your suggestions for things you'd like me to review. (c)2018 The Toy Box Philosopher. All rights reserved. Theme images by latex. Powered by Blogger.